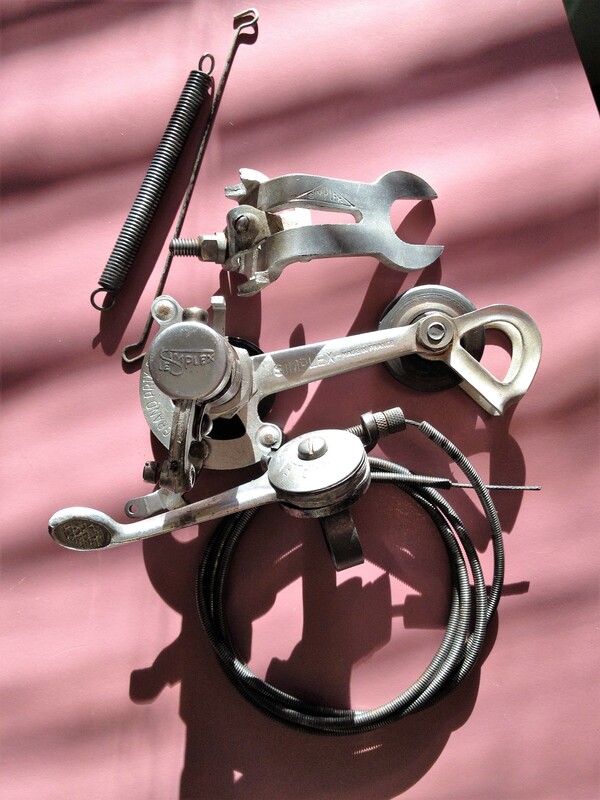 Stem mounted shifters were often standard equipment on bike boom “10 speeds”. 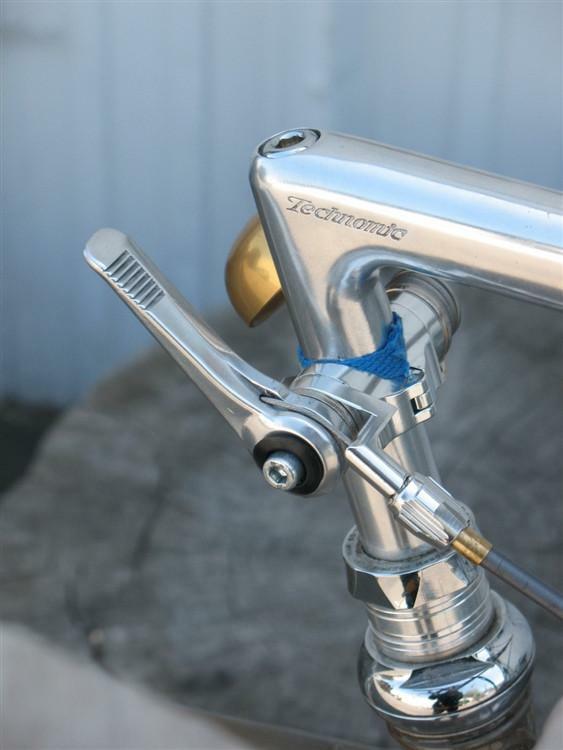 Consequently, they picked up a reputation of being low-end components, even though the only difference between these shifters and others (downtube, bar-end, and handlebar-mount) was their placement on the bicycle. During the 1970’s no one thought that bike boom 10 speeds were bad, per se. In fact, Americans embraced these bicycles, which were a welcome alternative to the heavy, clunky, no gear bikes of their childhoods. 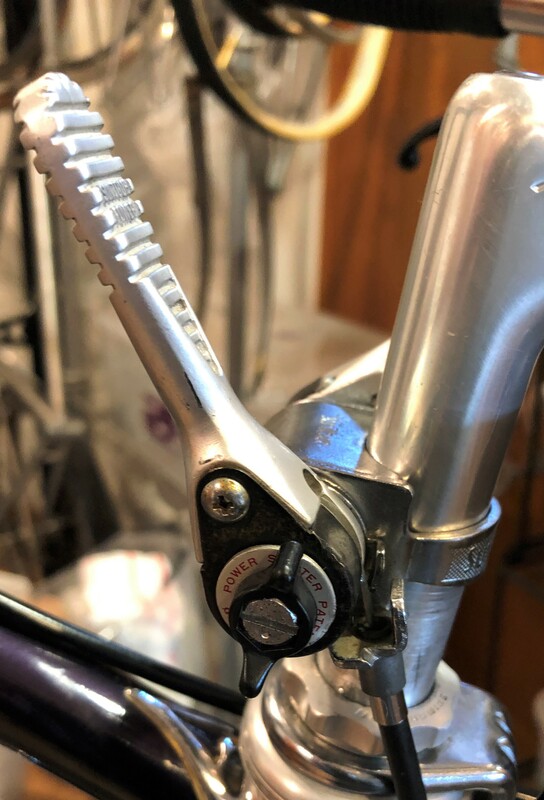 Stem shifters were not derided back then and even high-end bikes were sometimes equipped with stem-mounted shifters, including treasured Schwinn Paramounts of this era. What would be the reason to use stem-mounted shifters instead of bar mount or bar end shifters, which also offer the option to shift without changing your posture on the bike? As many cyclists know, downtube shifters can be tiring to use if you have to do a lot of gear changing. 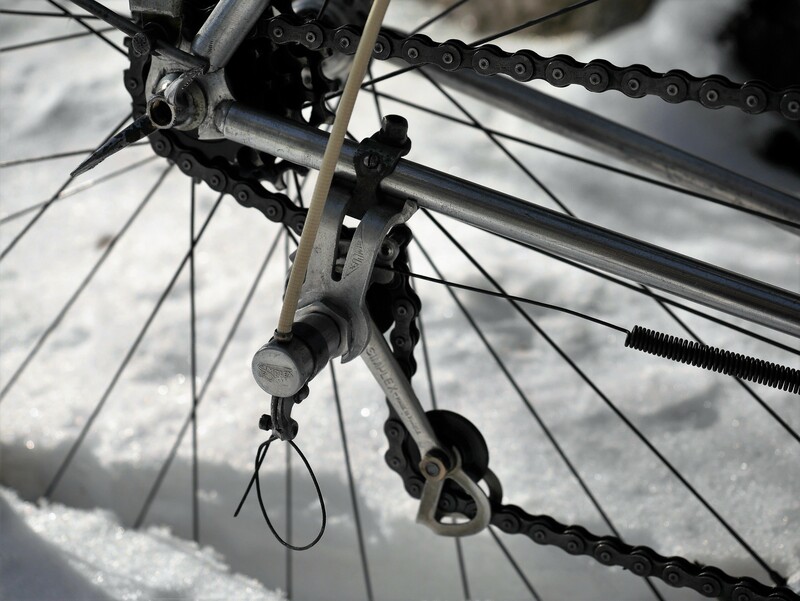 That’s one reason why transportation cyclists prefer bar mount shifters, and touring cyclists love bar ends. 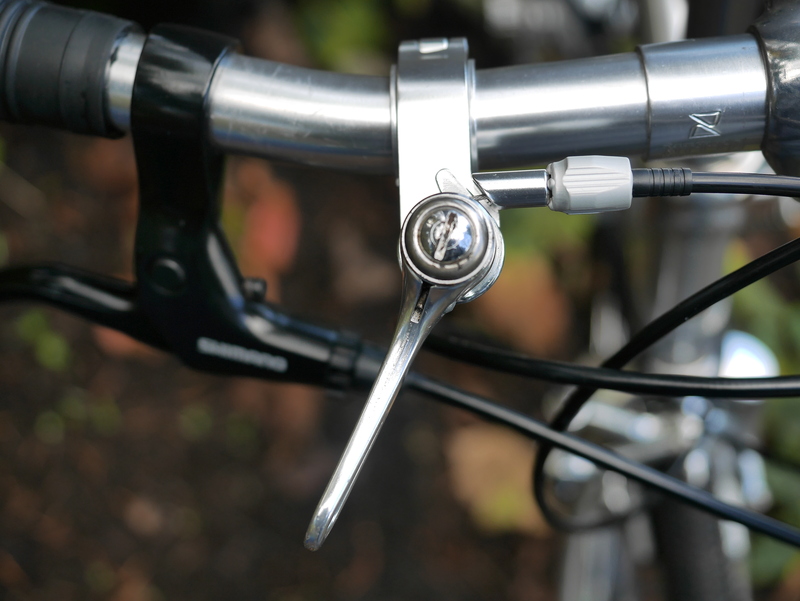 Bar ends work well with drop bars because they are positioned well on the lower drops, pointing straight back at the rider and offering easy access. But stem mount shifters offer several advantages that bar ends and handlebar mount shifters don’t: for riders using upright bars they free up the bar to allow for multiple hand positions, and even if you love bar end shifters (as I do), not all handlebar shapes are ideal for their mounting position at the end of each bar end, depending on the shape of the handlebar you are using. 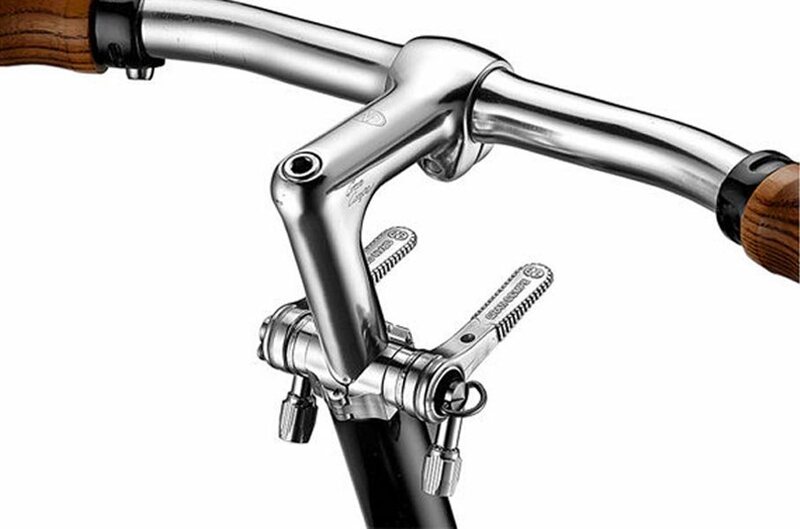 Bar end shifters can only be used with road diameter 23.8 bars, as opposed to 22.2 bars which are the standard width for upright bars (although note that many upright bars are now offered in both widths). And that’s where the lowly stem shifter comes in. Recently I have been converting some of my drop bar bikes to upright style bars. 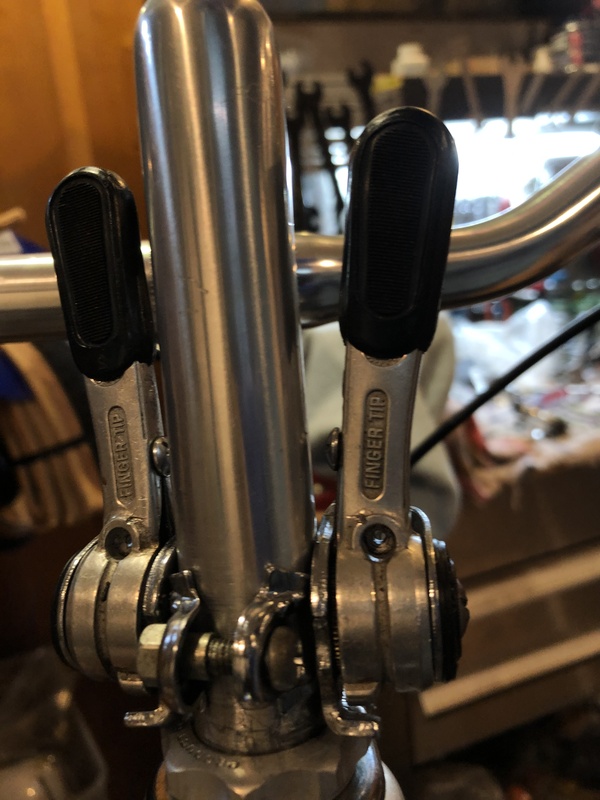 Since I’d like to be able to keep as much “real estate” on the new upright bar as possible, for multiple hand positions, I thought about using stem shifters. 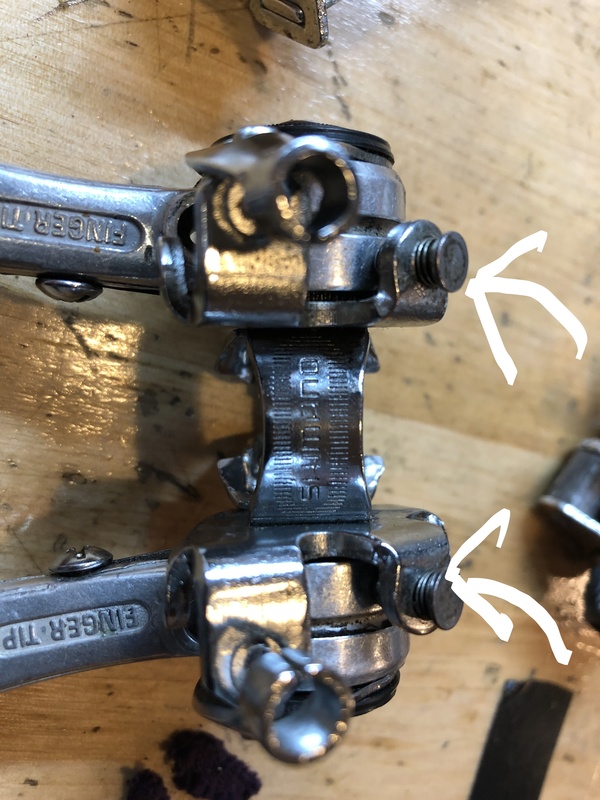 I went to my parts bin to see what was there, and that’s when it dawned on my why these shifters are not necessarily desirable. First of all, the levers on some of these examples are HUGE. This SunTour model towers over its counterparts of this era. And, SunTour offered such a clunky-looking mount to the stem, with a lot of unnecessary material. That made me think about using an alternative system to get the shifters up onto the stem. Before taking to the internet for research I experimented with using V-O’s thumbies mounted on the stem. While maybe not such a crazy idea if using a single chain ring up front, the two shifters mounted on the stem may look pretty whacky, depending on your perspective. But the main problem with this idea is the positioning of the cable stops which point straight down. With new ideas welcome, I researched the current stem mount shifters available in the markeplace. The above pictured Dia-Compe ENE stem mount shifter is an interesting innovation. First of all, the shifters are designed to be at rest pointing forward, which means that when engaged they will not be pointing ominously toward one’s private parts. 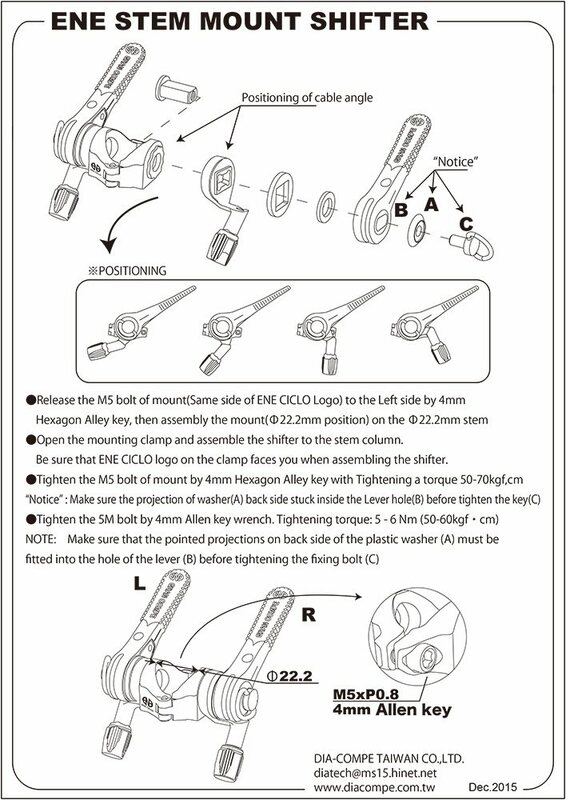 And, the cable stop is fully adjustable, as shown on the above technical diagram. That is a very nice feature. 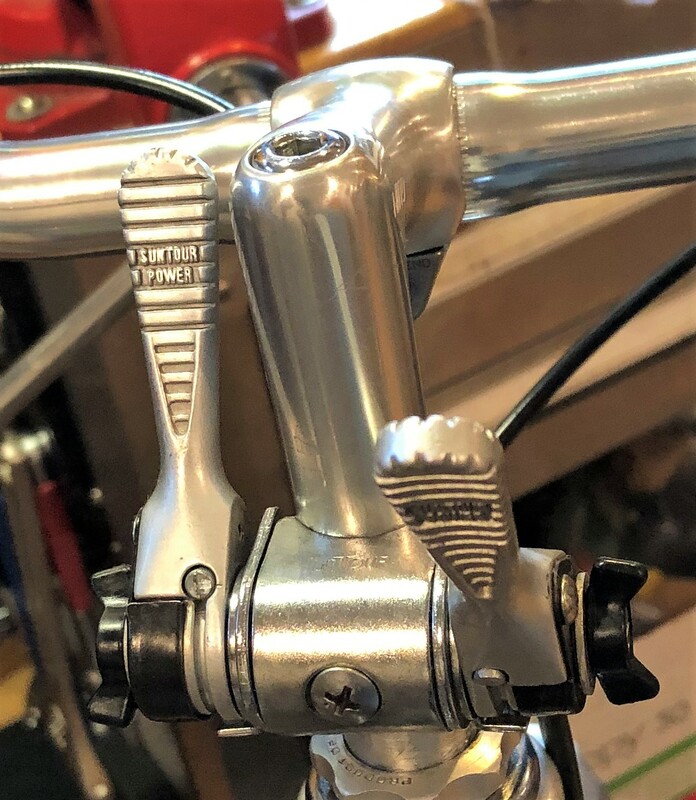 However, it looks like these shifters may no longer be available, at least in the U.S.
Before heading that direction by purchasing a new component or shifter mount, I made several attempts to install vintage stem shifters on a current project. One must firstly separate the characteristics of the shifter itself from the stem mounting issues. These Shimano FingerTip shifters have always baffled me, but today I decided to put dismay at bay by setting these shifters up. 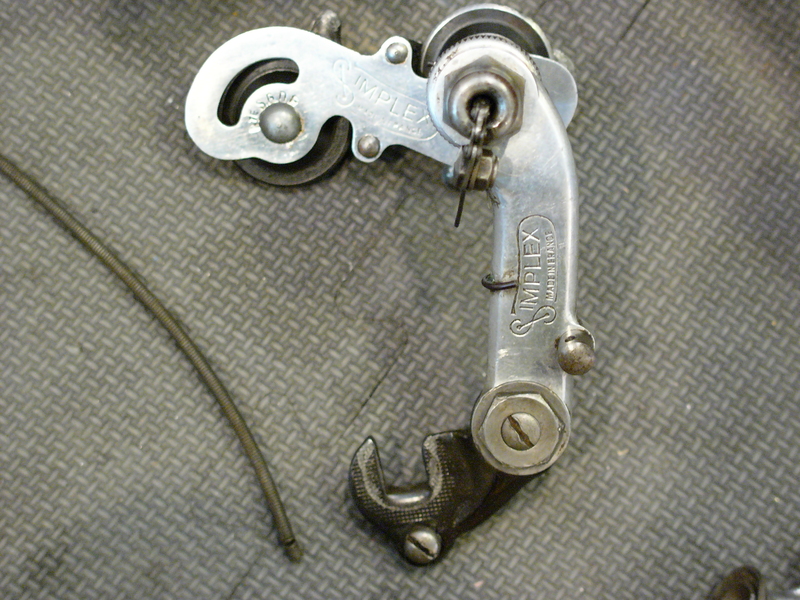 These ratcheting shifters have a manually operated stop (see photo above) which allows one to set up the shifters by pushing in the stop to keep the shifters in their upright position. Once the stop is released, the counterbalance spring offsets the pull from the derailleurs, keeping everything in balance for easy shifting. Shimano made a bar end version of this as well. The cable stops on these shifters point straight ahead. It would be ideal if they pointed more downward. 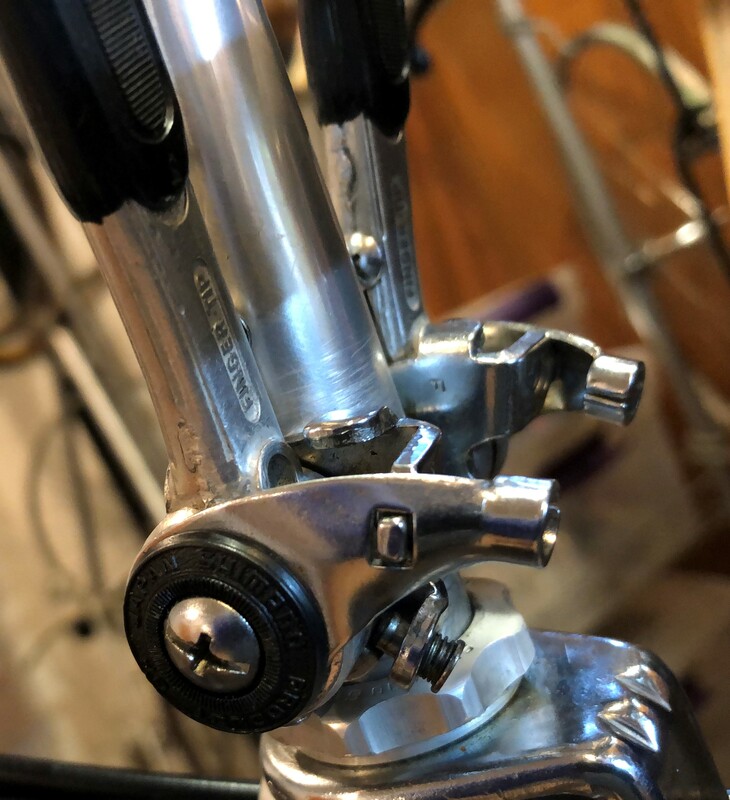 After ruling those shifters out I ended up installing SunTour’s ratcheting shifters, which have a nicely angled cable stop and look okay from the front of the bike. While I don’t care for SunTour’s over-engineered clamp style, the appearance is not terrible and I can live with it. But, best of all, these are SunTour ratcheting shifters which were so well-engineered and offer easy and subtle gear changes. 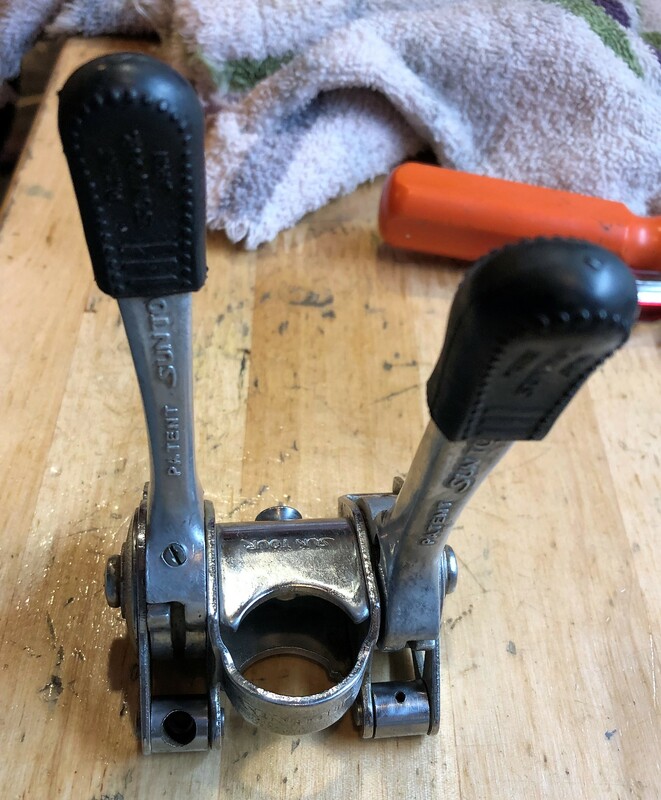 As part of setting up this shifter mechanism, I disassembled the shifters, cleaned the parts with alcohol and lightly abraded the washers with emery cloth to improve the shiftiing quality. Mission accomplished. Another option is to use a new stem mounted shifter clamp, allowing one to use any shifter of your choice. This component from Rivendell looks interesting. The cable stops are angled at about 45 degrees, and that might be just about right depending on the placement on the stem. 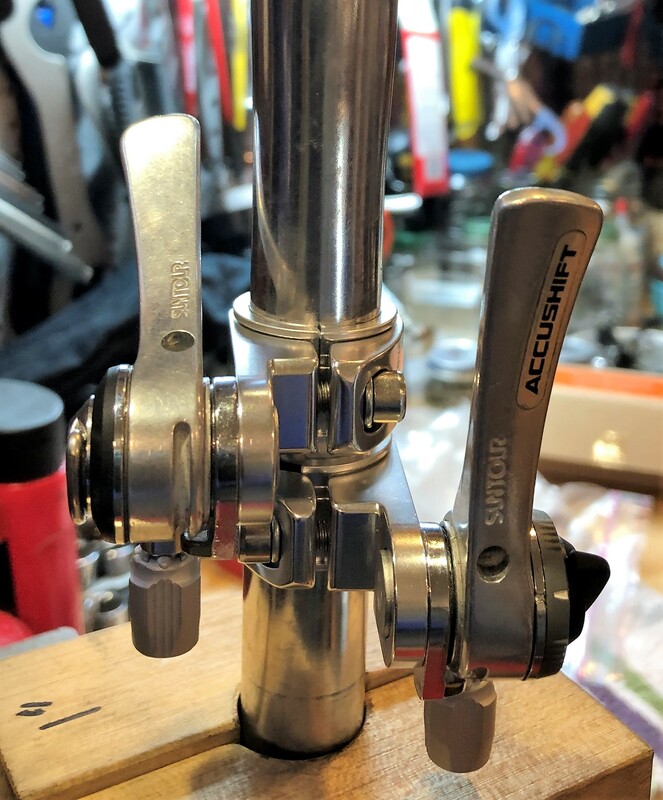 Meanwhile, I’m going to use my stem mounted ratcheting SunTour shifters and will follow up again with an evaluation of their performance. 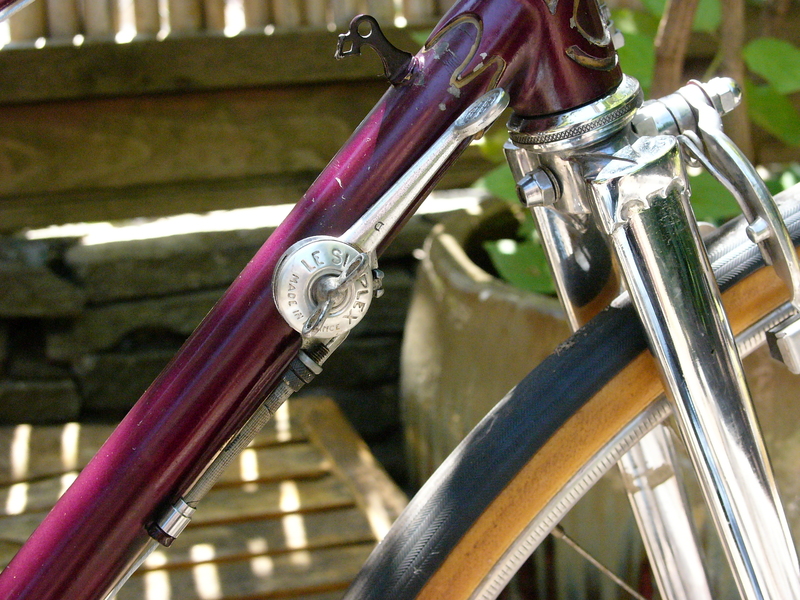 Vintage bicycle frames and components can have unique cable stops that require specialized ferrules. Also known as “end caps”, these little guys create a stable connection between flexible brake or shifter housing and the related component. 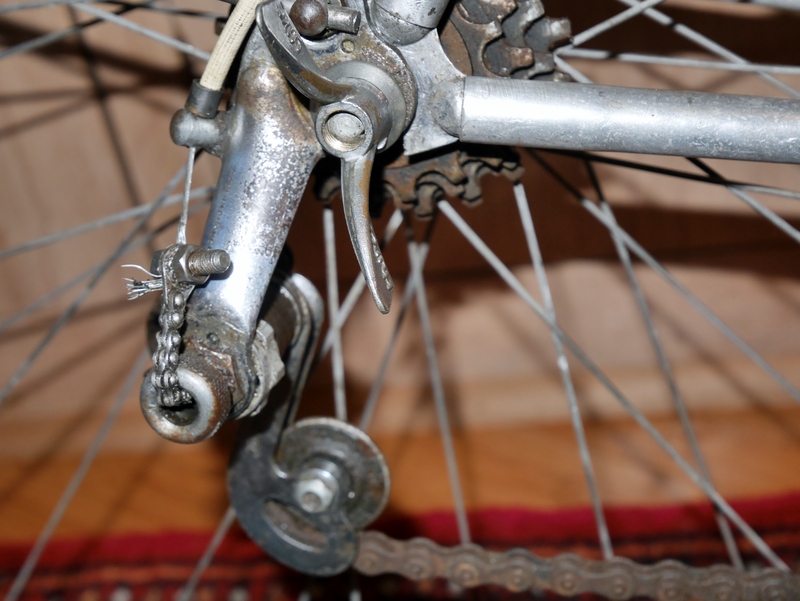 Some vintage frames have no cable stop braze-ons, and instead use clamp-on stops. And, frames with cable stop braze-ons may have a number of different styles, requiring specialized ferrules. 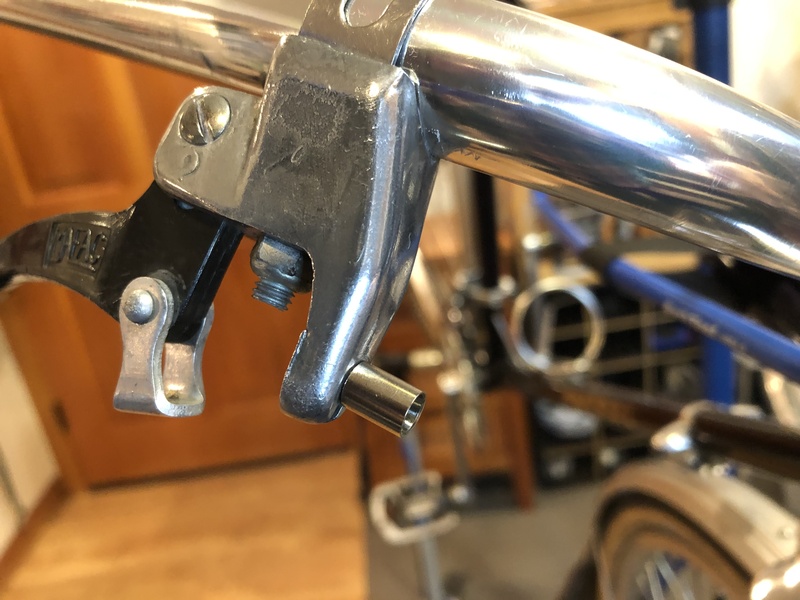 The type shown above is a split shifter stop, making it easier to maintain the cables, as the whole unit can be lifted out of the stop’s split top. But, the ferrule required to fit into the stop needs a tiny step down. 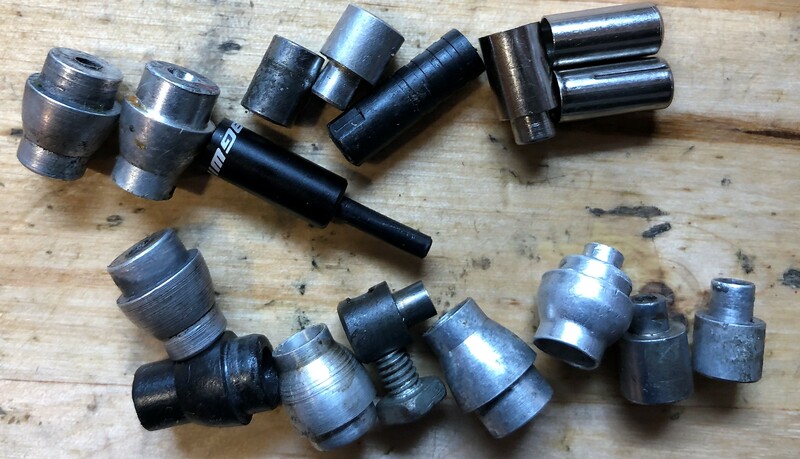 Vintage components also feature a number of different styles of ferrules. 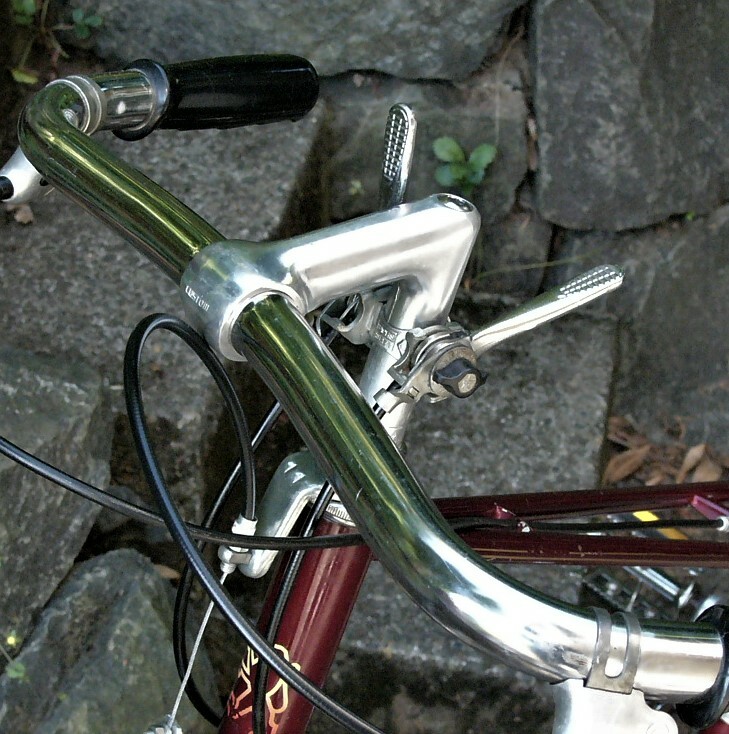 Brake levers designed for upright bars often include “fatter” ferrules which have a wide connection to the component – wider than the actual housing. 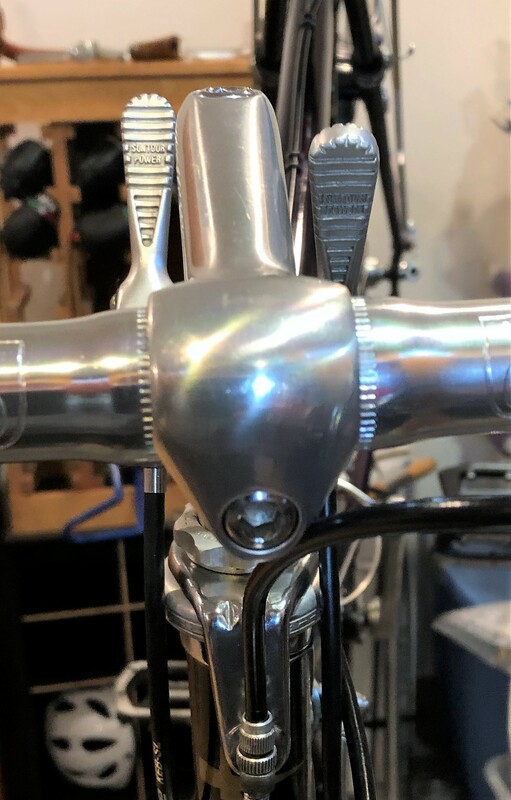 The rear brake cables of mixte frames are sometimes mounted from beneath the brake caliper and require different ferrules and hardware to accomplish this feat. 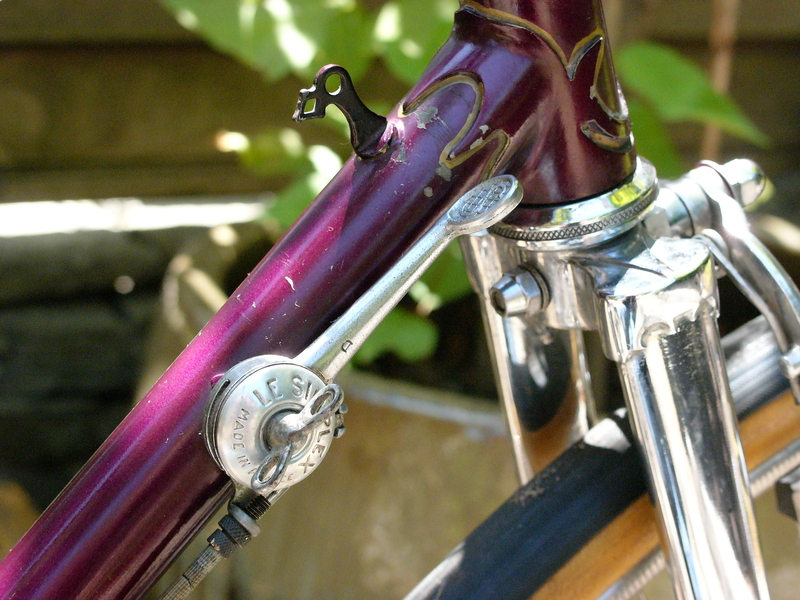 The photo above highlighted with the arrow is an example of a specialized ferrule used on a mixte frame. Vintage brake and shifter housing comes in a variety of sizes, but the most common size for brake housing (and often shifter housing as well) is 5mm. Prior to the 60’s or so, shifter housing was narrow, at 3 or 4mm, and sometimes but not always in raw helical state. The above photos show a late 40’s Simplex TDF derailleur which uses 4 mm helical housing covered with a vinyl casing. 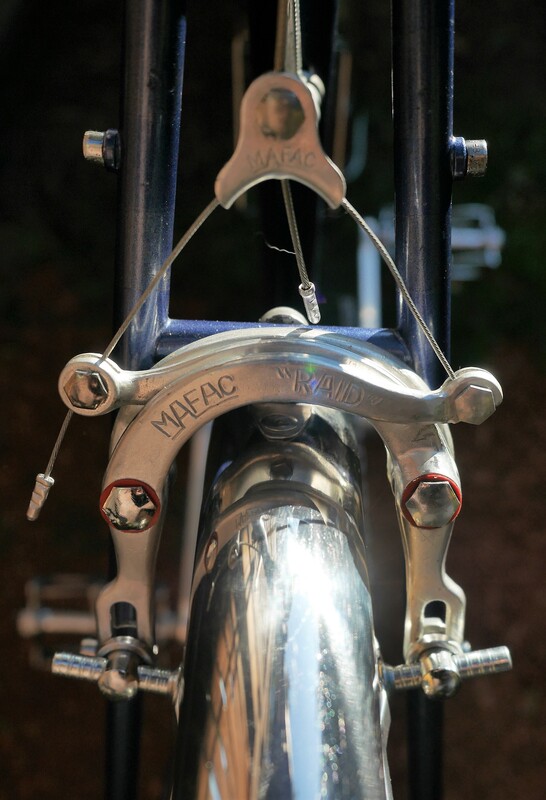 Sometimes frame-brazed cable stops exist even where they are not needed, as in the case of this mid-century custom French frame shown above. The shifter cable stop brazed a few centimeters below the shifter mounts serves no purpose, except maybe to look interesting. Mission accomplished! 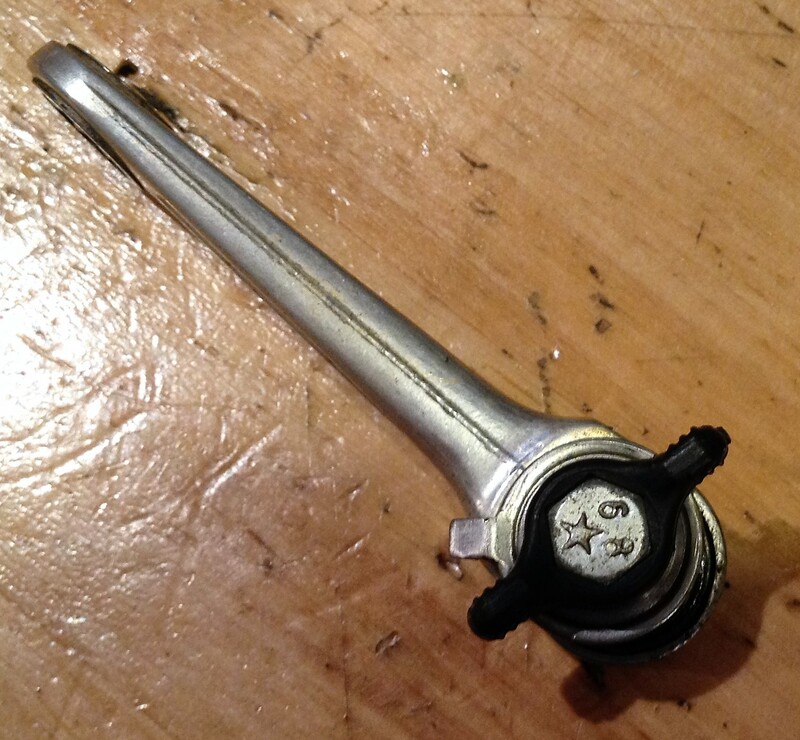 Working with vintage components, especially brake levers, can mean trying to source unusual ferrules. 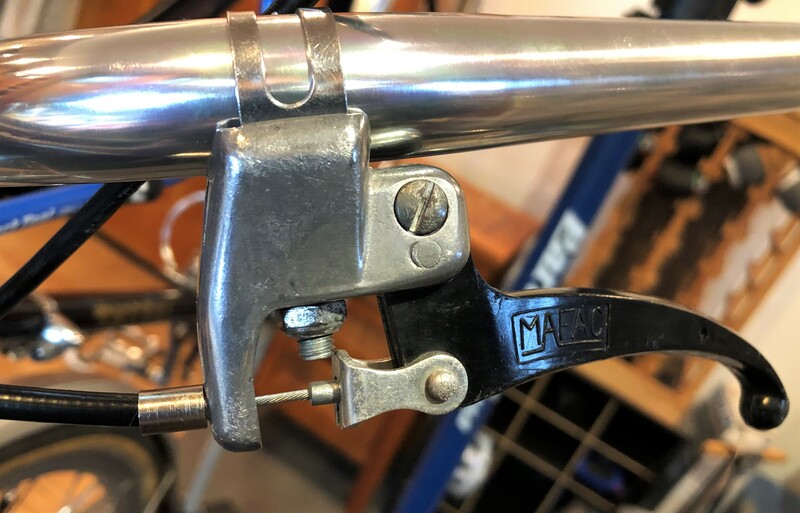 Recently I needed to set up some vintage Mafac flat bar levers. The openings in the brake mount were very narrow, and none of my vintage ferrules had a step down small enough to fit into the space. 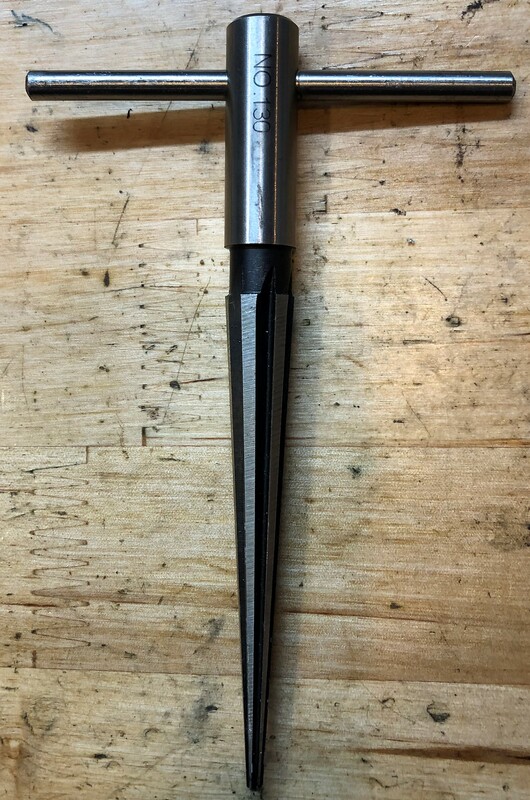 So, I judiciously used a reamer tool to slightly enlarge the hole so that a stepped down ferrule (courtesy of Problem Solvers) would fit into the component. A tight fit is okay! Here is the vintage Mafac lever set up with the stepped down ferrule. These days, it may be difficult to source a specific ferrules for vintage applications. It appears that Problem Solvers no longer supplies unusual ferrules. That means you may need to locate an entire vintage brake or shifter unit in order to continue restoration of your current project. As part of reviving and restoring any vintage bicycle, it may become necessary to replace components with period correct counterparts. 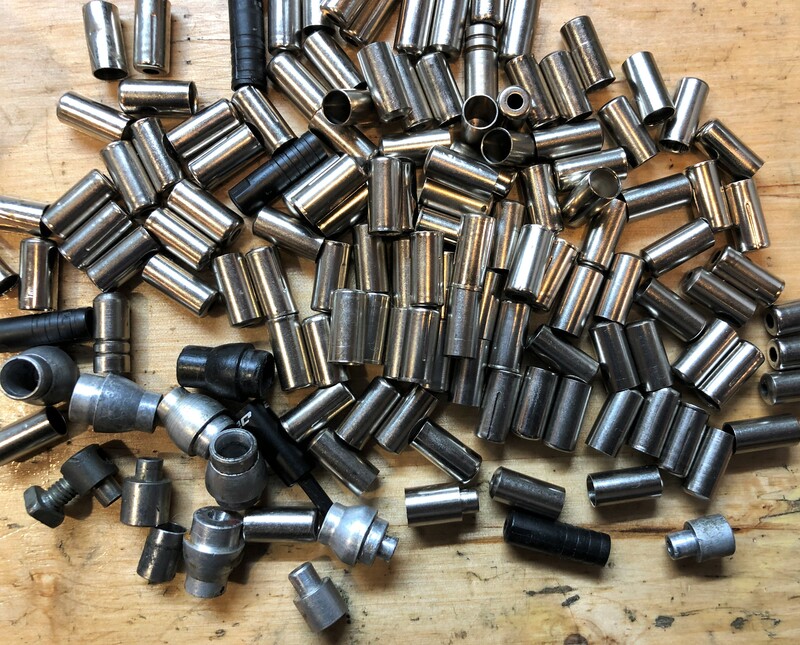 Replacing fasteners and other hardware can also present challenges, given not only their special purpose, but also their one-off threading, which may be French, not-so-French, Italian, and other threading anomalies. Over the last 10 years I have restored a number of vintage bicycles that presented challenges in both the component and hardware categories. The mid-century Mercier Meca Dural that I restored a few years ago was fitted with an incorrect wheelset and rear derailleur. 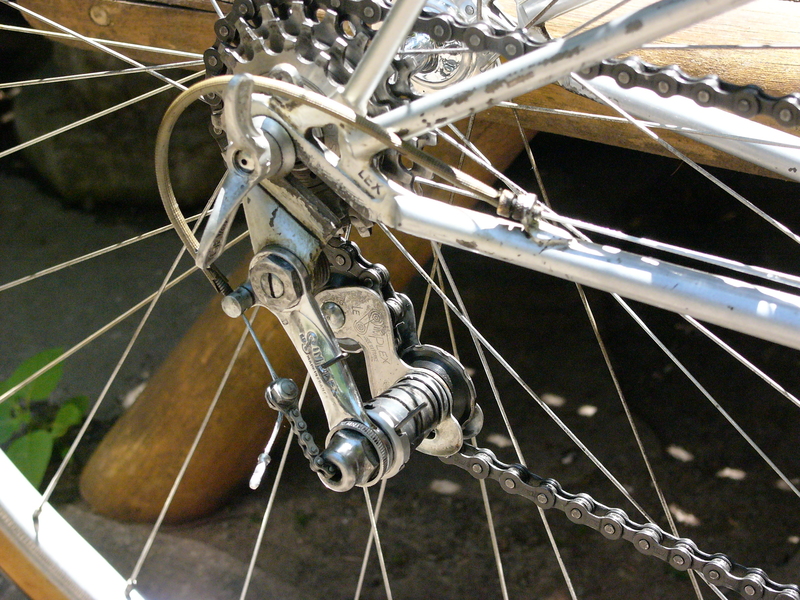 The Huret unit, depicted first, was installed on the bike’s vertical dropouts, yet this rear derailleur is designed for horizontal dropouts. This was an example of modifications made to the original bike, with bad results. 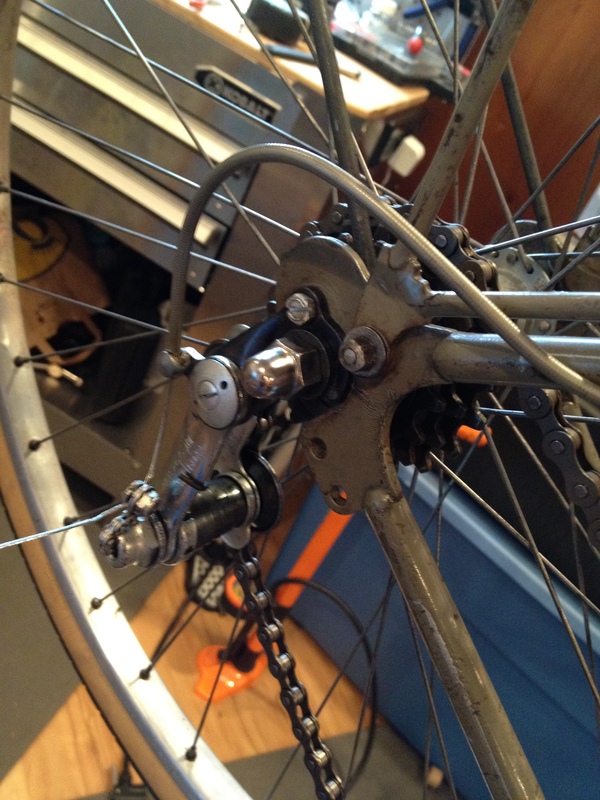 The incorrect Huret derailleur mounted on the vertical drop-outs resulted in no chain wrap, and poor shifting. 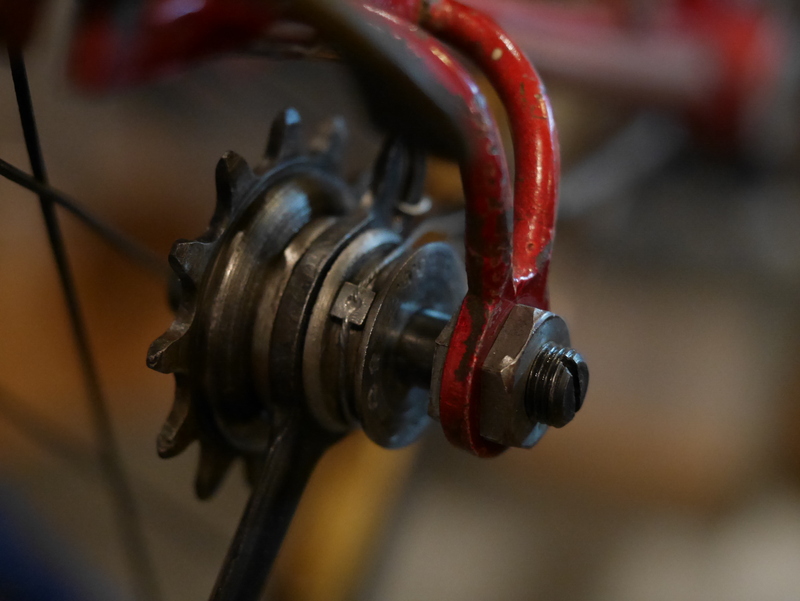 After seeing that the bike had also been modified with an incorrect and too large wheel size, I took to French eBay to source a NOS chainstay mounted Simplex bell crank derailleur – a component which was standard fare on vintage Mercier Meca Dural bicycles of this era. When the NOS derailleur and shifter arrived, I rejoiced in how beautiful and functional this vintage component was. Searching foreign language sites broadens the scope of your endeavor, and may make the difference between success and failure. Simplex was notorious for using oddball threading on its components. 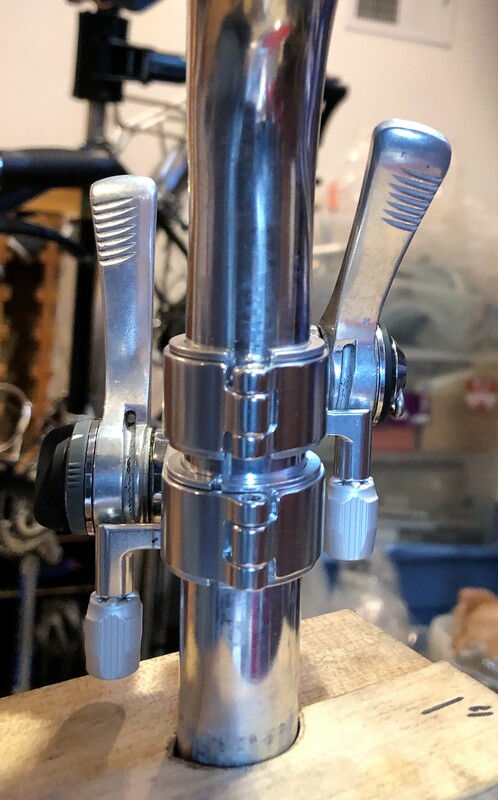 The 2nd photo above shows a Simplex shifter with M6 x .8 threading – instead of the standard M5 x .8 on all other shifter bolts of this era. I have a tap and die set of tools in my shop to use in the event that re-tapping is necessary. However, I try avoid this if replacement vintage components can be found with the original threading. Sometimes, things work out well, as was the case with this mid century mystery French mixte with Oscar Egg lugs. The Simplex components on this bike were clearly all original and worked perfectly once the bike was overhauled. 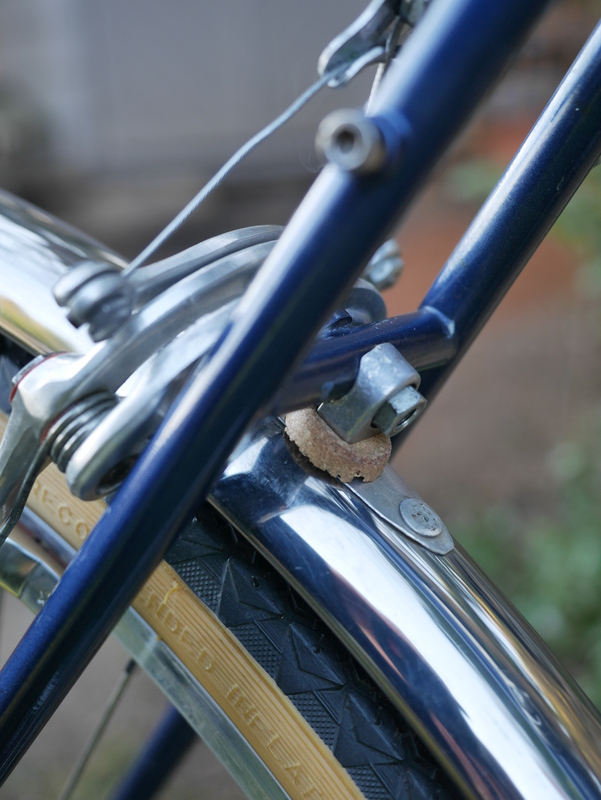 If you will need to add or replace fenders on a vintage bicycle I recommend exploring Velo-Orange, Rivendell, and Compass. These vendors offer different products and hardware from a variety of manufacturers, and you may be able to find just the right fender width and hardware for your application. Fender stays, bridge mounting hardware, and daruma and eyelet bolts are usually included in your purchase of new fenders. Meanwhile, I can’t think of any manufacturers today who are making a fender resembling these lightweight and well engineered steel fenders shown on this early 1980’s Meral, above. These fenders mount easily with the original hardware and work fine with a 650b conversion. They are an example of the unsurpassed beauty and utility of vintage components.